Q: What do you mean when you say “dental disease”? A: When we refer to “dental disease,” we mean all diseases affecting the gums, teeth, roots and underlying bony structures in and around the oral cavity (mouth). When we talk about "dental disease," we are most commonly referring to periodontal disease, which occurs when plaque and tartar spread below the gumline, causing inflammation of the gums and bone loss around the teeth themselves. Although we cannot know exactly what’s going on below your pet’s gumline until we take dental xrays, our veterinarians at CVH evaluate your pet’s oral health once a year at his or her annual wellness exam. Based on that exam, we assign a “grade” to your pet’s periodontal disease, with grade 1 representing mild, early periodontal disease and grade 4 representing severe or advanced periodontal disease. This allows us to keep track of the progression of your pet’s dental disease from year to year and helps us to decide whether a professional dental cleaning is needed. Q: What causes dental disease in pets? A: Dental disease begins when bacteria in your pet’s mouth collect to form plaque, which hardens into tartar that can spread below the gumline. Once tartar spreads below the gumline, it begins to cause problems not only for your pet’s oral health, but also for their health as a whole. Q: Will a dental cleaning fix my pet’s bad breath? A: In the short term, yes, a professional dental cleaning can make a world of difference when it comes to improving your pet’s breath, but it’s not a permanent cure. Without regular toothbrushing, odor causing plaque and tartar will begin to build up on the teeth again. Tooth brushing, water additives, and other preventive measures can help keep your pet’s breath fresh much longer, but it’s unlikely that your pet will ever have breath that is as minty fresh as your own! Q: How do I know if my dog or cat needs to have their teeth cleaned? A: At CVH, we evaluate your pet’s oral health each year at their annual wellness exam, and your veterinarian will let you know if he or she recommends a dental cleaning at that time. Your vet will also include the results of your pet’s oral exam in his or her medical record at each annual exam, so we’ll be able to track the progression of your pet’s dental disease from year to year and let you know when a cleaning becomes necessary. In between annual exams, you can also schedule a free oral evaluation with our technicians for advice about whether a dental cleaning is needed. 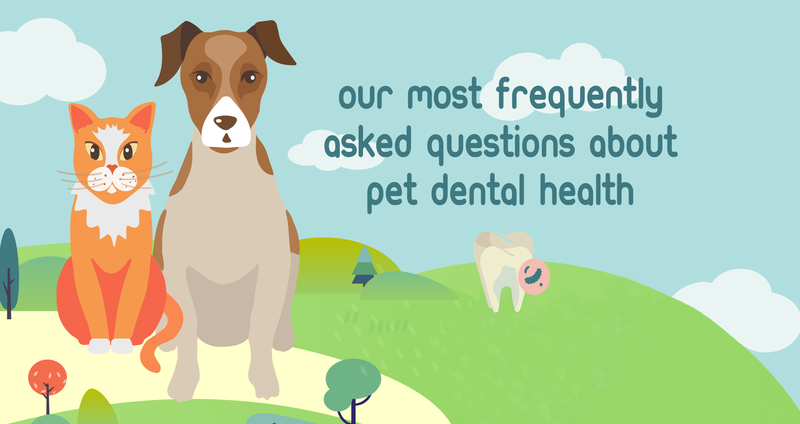 Q: If I brush my pet’s teeth at home, will I improve their oral health? A: Home oral hygiene treatments like tooth brushing with a pet safe, enzymatic toothpaste can help to maintain a healthy mouth, but the goal of tooth brushing is to stop plaque from hardening to form tartar on your pet’s teeth, not to remove tartar that is already there. Once tartar is present on your pet’s teeth, the only way to remove it is with a professional dental cleaning. Q: How long will it take to clean my pet’s teeth? A: Dental cleanings are done as an outpatient procedure, so plan to drop off in the morning between 8:00am and 8:30am and pick your pet up in the mid to late afternoon. Your veterinarian will call you after your pet’s dental cleaning is done to let you know how everything went and to let you know the earliest possible pickup time. That said, your pet is also welcome to stay with us later in the day if that makes arranging pick-up easier on your schedule! We ask that pets be picked up by 6:30pm on Mondays and Thursdays, and 5:30pm on Tuesdays, Wednesdays, and Fridays. Q: Why does my pet need to undergo anesthesia for their dental cleaning? Wouldn’t it be safer to avoid anesthesia? A: Although there are people who feel that anesthesia free dentistry is possible, we agree with the American Veterinary Dental College, which has determined that it is impossible to do a thorough subgingival cleaning without anesthesia. It is crucial that we're able to do this kind of thorough cleaning because it is underneath the gingiva where all the bacteria hang out and cause serious issues for your pet's health. Without anesthesia, this kind of cleaning would be painful and scary for our many of our pets. Imagine your dentist probing below the gum line when your gums are sore and inflamed. The experience is no different for our pets, and we could not and would not ask them to sit still through that process. In addition, anesthesia makes it possible for us to keep your pet still enough to take dental xrays, which show us whether or not there is bone and root damage below the gumline, and allows us to do oral surgery as needed to treat advanced dental disease. Although no anesthetic procedure is 100% risk free, we minimize the risks through our anesthesia protocols, continuous monitoring, IV catheters and fluids throughout the procedure, and more. Without anesthesia, we would not be able to give your pets the pain free, fear free, thorough care that they deserve. Q: Can I skip the dental x-rays in order to save money on my pet’s dental? A: Although there are almost certainly vets out there who are willing to skip dental xrays as a cost cutting measure, we feel that it is medically irresponsible to do so. Having your pet’s teeth cleaned but skipping the xrays risks ignoring problems underneath the gumline, including bone loss, tooth root decay, or jaw abnormalities. This means that despite the expense of having your pet anesthetized for a dental cleaning, they could still have teeth that are diseased below the gumline but go unseen and untreated. This would put your pet at risk for developing tooth root abscesses and other conditions that would require them to be anesthetized all over again for treatment, potentially within months of the original dental cleaning. We feel that it's best to just do it right the first time, which is why we include dental xrays in every dental cleaning we do. Q: How much will my pet’s dental cleaning cost? A: That’s a difficult question to answer, because cost varies based on the severity of your pet’s dental disease. If your pet has been seen for an annual wellness exam at CVH in the last 6 months, our front desk can put together an estimate for you. If not, the best way to know what to expect is to schedule a free oral evaluation for your pet so we can give you a written estimate of costs tailored to your pets oral health status. Q: Can I schedule my pet’s dental cleaning on a Saturday? A: Unfortunately, no. We are unable to do dental cleanings on Saturdays because our office is only open until 1pm and recovery from anesthesia cannot be rushed! We do dental cleanings Monday through Friday each week, with drop off between 8:00am and 8:30am and pickup as late as 30 minutes before we close each night. Q: How soon can I pick my pet up after their dental cleaning? A: This varies based on how early in the day your pet was anesthetized, how long their particular dental procedure took, and how quickly they recover from anesthesia. In general, pickup is available as early as about 3pm, although your pet is welcome to stay with us until the end of the day. If you need to pick your pet up earlier than 3pm, please let the front desk know what time you’re hoping to pick your pet up when you book your appointment, and they will let you know if our surgery schedule allows us to accomodate a pickup at that time! Q: How often does my dog or cat need to have their teeth cleaned? A: This is a difficult question to answer, as it can vary widely from animal to animal. A mixture of genetics, jaw structure, home oral healthcare, and lifestyle can make a huge difference in how often your pet’s teeth need to be professionally cleaned, and the only way to know is to have them evaluated by your veterinarian. Q: How can I take care of my pet’s teeth at home in between cleanings? A: The best thing you can do to take care of your pet’s teeth at home is to brush them daily. That said, daily brushing often isn’t a realistic goal, whether it’s because your pet doesn’t tolerate daily brushing or because you just don’t have time to add one more thing into your daily schedule. If daily brushing is not possible, brushing as often as possible is a great way to take care of your pet’s teeth. If brushing is not possible at all, there are a number of other products to help keep your pet’s mouth healthy. These products include a gel that you rub along your pet’s teeth and gums, a water additive, and a food that helps to disrupt the formation of tartar on your pet’s teeth. Different pets need different solutions, so feel free to ask us about the best plan for your dog or cat the next time you’re in the office! Have more questions than we've answered here? Don’t hesitate to call us or book an oral evaluation for your pet to learn more. We're here to help!